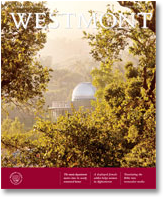 Dennis ’69 and Sue Savage both have close connections to Westmont. A gifted runner, Dennis came to campus to compete on the track team. He set records that still stand today and won a spot in the Warrior Hall of Fame the first year it opened. While he enrolled as a non-believer, he graduated as a committed Christian. For 26 years he has taught biology and science in Santa Barbara schools. Although Sue earned her B.A. and M.F.A. in art from UCSB, she had many Westmont friends and met Dennis at a Bible study hosted by former president and professor Lyle Hillegas. An exhibiting artist, she also teaches art at Westmont and serves on the Art Center Council. 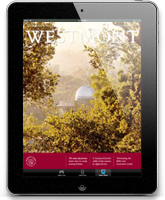 Because they see the value of investing in students’ lives and appreciate what Westmont has accomplished in theirs, Dennis and Sue have made a provision for the college in their estate. For more information about the Wallace Emerson Society, call Iva Schatz, Director of Planned Giving, (805) 565-6034.